Catalogue for the exhibition that took place from October 7th to December 12th 2009 at the Mona Bismarck Foundation in Paris, of historical costumes, coats and ceremonial evening gowns that tell the story of Queen Marie-José of Italy (1906-2001). 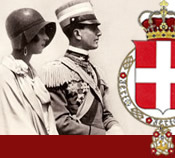 Catalogue for the exhibition that took place in Torino from July 1st to November 2d, 2008, of the court gowns of Queen Marie-José of Italy in 1930-40. The queen was an unconventional and exuberant character and this exhibition traces the way she knew how to wear a resolutely modern style in the ceremonial of the court. Thejewels that have accompanied the various queens of the Kingdom of Italy. Book of photographs of the Royal Palace of Torino in the early twentieth century. Catalogue for the exhibition organised by the city of Albertville on the occasion of the 1992 Winter Olympic Games, from the collections of the Foundation Humbert II and Marie-José of Savoy. Editions France-Empire - Paris 1992. Catalogue for the exhibition that took place from November 5th to 21st 1992 in the Town Hall of the XVI arrondissement of Paris on the occasion of the event "Le mois de la Photo", about albums of the history of the Great War told in pictures by a soldier-king to his young son. This publication dedicated to the illuminated books of the House of Savoy presently dispersed in several libraries, pieces together the image of the artistic and literary Savoyard culture in the Middle-Ages. It has 64 colour plates and 42 black and white illustrations. First catalogue of the printed book collection of the Humbert II and Marie-José of Savoy Foundation, formed around the nucleus of late King Humbert II’s library. La maison de Savoie - Amédée VIII, le Duc qui devint Pape. 819 pages, 8 maps one of which folded, many inset genealogical tables and illustrations. La maison de Savoie - Les origines. - Le Comte Vert. - Le Comte Rouge. 425 pages, 1 folded map, many inset genealogical tables and plates, important bibliography, index. Catalogue for the exhibition that took place for the sixth centennial of the retractation of Nice in the Palais Lascaris from September 28th to December 11th 1988.